Cookie&Beans is run by Jena Keenan, mother of one. She has had lots of experience taking care of children from teaching Sunday School and working with Young Life Canada, a mentorship program for teens, to being an au pair for a family abroad. She loves children, and feels very strongly about child advocacy. She has been involved with Compassion Canada for 15+ years, and can be contacted if you would like to sponsor a child through Compassion Canada. 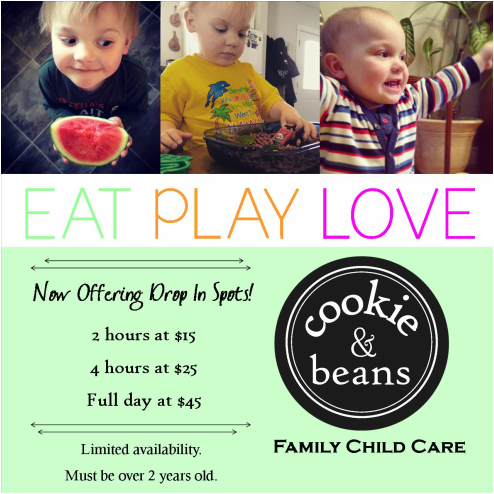 Cookie & Beans will focus on earth friendly values, child development and guidance. That is what is most important. Need Information About Child Care? If you would like more information on my policies, please let me know in the comment section. Thanks!